Glühwein is a hot, sweet mulled wine that's best drank in the cold winter months. Many places often don't even serve this wine in the summer. The most popular time to drink glühwein is at a popular Christmas market. When it's bitterly cold outside and the warm cup feels nice in your hands, it can be easily to sip this sweet hot drink quickly. At around nine percent alcohol or more, it may be wise to slowly sip on it. Aperol spritz can be found at nearly every restaurant in Germany. It's actually an Italian drink created by mixing together the Aperol pre-made mix, prosecco, soda water, ice, and a slice of orange to top it off. The resulting taste is sweet and light. This popular summer drink is best enjoyed at a sunny cafe with friends. To people outside of Germany this drink may sound strange, but once you've tried it you'll find that it's quite delicious. A radler is simply a mixture of half beer and half soda, usually cola or sprite. A radler is often preferred over a regular beer when you don't want the full alcohol content, but many prefer to drink these simply because they like the sweeter taste. 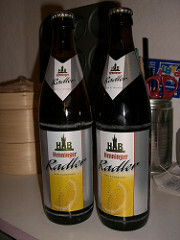 In fact, radler's are so popular that nearly every German beer brand sells them in pre-mixed bottles. As with others listed, this drink is more popular in the hot summer months when people want something light and refreshing to cool down. While it's also found in America, this drink is really popular in Germany, especially in the summer months. Rosé is a light bodied sweet wine that has a pink color. It's preferred when the weather is warmer because it's served cold and has a light taste. Rosé is originally a French wine but is very popular throughout Germany. Although red and white wines are also popular in Germany, rosé is a common drink among locals. 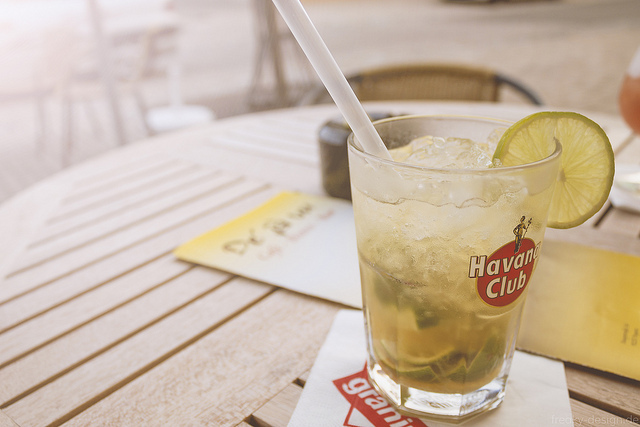 Although not native to Germany, Germans love this Portuguese drink which is a refreshing mix of lime, sugar, lime juice, and cachaca. The sugar, lime juice, and lime, which is cut into slices, is mashed in the bottom of a glass. Then the cachaca and ice are added to complete the drink. It's a light and tasty drink to sip on during summer months. Be sure to mix it up a bit before drinking, however, so you don't end up with a mouth full of sugar. No German drink list is complete without mentioning German beer. Not surprisingly, beer is the number one selling alcoholic beverage in Germany. There's a brewery in nearly every town and countless beer gardens as well. Germany is also home to the largest beer festival on the planet, Oktoberfest. The most popular beers are pilsner, lager, and a variety of weizen beers including dunkelweizen (dark wheat beer) and hefeweizen (wheat beer). Did you know? Many of the same mixed drinks can be found in Germany that are available in America. A long island, jack and coke, as well as other popular mixed drinks can be ordered at most restaurants throughout the country. Germany has much more to offer than simply beer in Germany. Now that you know what other drinks are available, the next time you visit you'll be a pro at selecting from one or more from this list to try out yourself.